Chloe Ronaldson (No.8 in the list of female British team members) was born on 30th November 1939. Aged just 13 she joined the National Skating Association in 1952 and on 3rd March 1958 won her first senior British Championship aged just 17. Her victory in the Quarter Mile on Herne Bay was seen by some as a "flash-in-the-pan", especially as the 2nd and 3rd placed skaters were both disqualified. Not only was this her first Championship gold medal, it was also her first Championship medal. The following year, though, there was no doubting that there was a new girl in town. She successfully defended her Quarter Mile title in 1959 and finished second to multiple World medallist, Pat Harris, in the Half Mile. A year later and she would win both Championships and was well on the way to establishing her name in the record books. For the three decades that followed, Chloe was virtually unbeatable in British Championships. Between her first victory in 1958 and he last in 1979 she entered 45 British Championship events...and won 38 of them!! Her record of 38 individual titles was only broken in 2011 by both Vincent Henry and Sutton Atkins, but considering that up until 1970 there was only two ladies Championships held each year one can see that this is a remarkable record that is unparalelled in British speed skating history. In addition to that she won the Senior Ladies Inter-Club Relay British Championship no fewer than 11 times, her last being in 1983. In her early years she skated for first for the Brixton Falcons and then Broadway Roller Speed Club but in 1966 she switched to Alexandra Palace R.S.C. After her victories in British Championships it was a foregone conclusion that international call ups would soon follow. Her first outing in a British vest, however, would end pretty much before it had even started. Having been selected for the 500 metres knock-out event in the 1960 World Championships in Wetteren, Belgium, the team was withdrawn in protest at the obvious incompetent judging during Barbara Woodley's run against a German skater in the same event. Coupled with Leo Eason's declassification from first to last place in the senior mens 5000 metres a day earlier the British team management boycotted any further competition resulting in Chloe's first shot at a World title ending somewhat prematurely. Still smarting from events in 1960, the Roller Speed Committee refused to send a British team to the 1961 World Championships in Voltrega, Spain, for the track and Gujan-Mestras, France, for the road. Another opportunity had gone begging for Chloe. In 1962, though, the stage was set for her to again show what she could produce on the international scene and she did not disappoint. In the 500 metres knock-out she made the final and came up against Marisa Danesi of Italy. In the best of three final it was Danesi who would take the gold medal, but at just 22 Chloe had shown everybody that she was capable of great things given the opportunity. Despite this it wasn't until 1965 in Siracuse that Chloe would again get another World medal - and again it was the 500 metres knock-out. This time the colour was bronze. There were no World Championships for women in 1966 but at the 1967 European Championships in Inzell, Germany, Chloe again achieved bronze in the 500 metres knock-out. A few weeks later, on the same track, she set new British Track Records for 500 metres (47.000 seconds) and 1000 metres (1 min 34.200 seconds) - remarkably, records that still stand to this day! Although Chloe continued to feature in many British teams throughout the 1970's she never won another individual medal in any major international competition, but aged 39 was part of the bronze medal winning British relay quartet in the 1979 European Championships on the track in Ostende, Belgium. Her final outing in a British vest came just a few weeks later in Leuven, Belgium, for the European Road Championships. Even now she could still manage a top ten finish with 6th in, yes, you guessed it, the 500 metres knock-out. She retired from racing shortly after but made a brief appearance in the British Championships of 1983. Now aged 42 and skating for Mercia she made a cameo appearance in the 300 metres time-trial and was only narrowly beaten by Denize Lipyeat. She also skated in the British Championship Relay event and went on to win it for a record breaking eleventh time with her new Mercia team mates. This was to be the last time Chloe Ronaldson took to the track competitively. In 1987 she took on the role of National Team Manager, a position she carried out on occasion up until 1992. 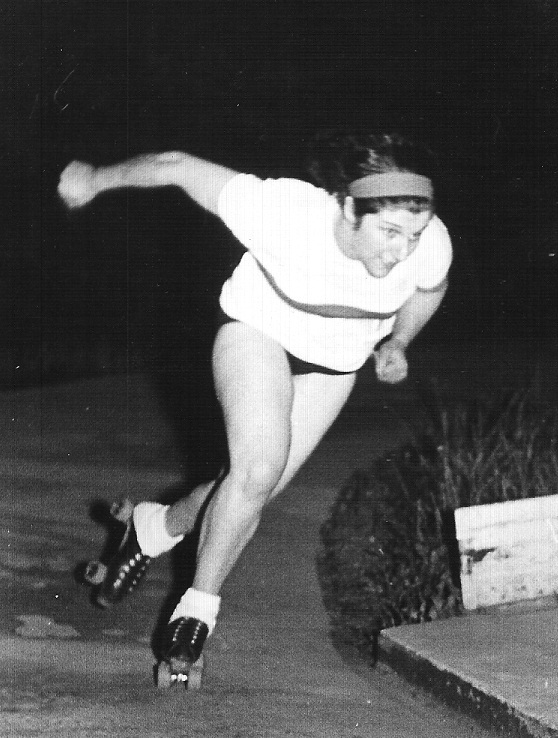 In that period she also headed up the Roller Speed faction of the Federation of Roller Skating (FRS) before stepping aside in 1993. Chloe continued to be seen regularly at race meetings as a track-side official, continuing to put back into the sport she had personally got so much out of. In recent years, though, Chloe's appearances have reduced somewhat. But despite her physical absence, her name is still recognised worldwide as undoubtedly the most successful woman in British speed skating history and a legacy of records that even now are recognised as an almost impossible task to repeat.